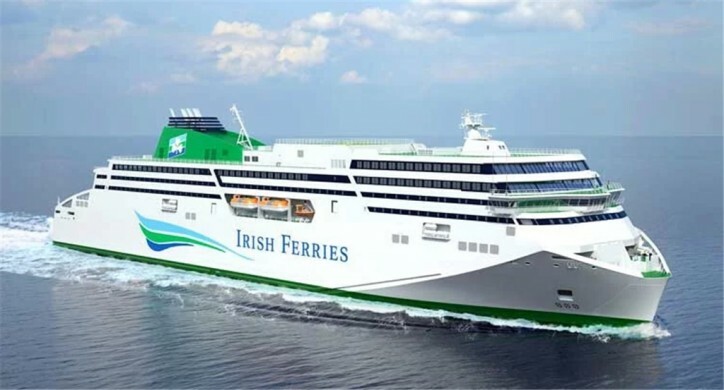 Irish Ferries has chosen W. B. Yeats as the name for its new €144million cruise ferry now being built in Germany for service on routes between Ireland, UK and France. The name was chosen after it had drawn ‘strong support’ from the public in an online competition that attracted nearly 100,000 entries. According to a spokesman: ‘it was clear from the poll that there is widespread public affection for W. B. Yeats, due in the main to the magnificence of his writings and his contribution to Irish society, theatre and the arts generally’. Recipient of a Nobel Prize for Literature, he helped to found Dublin’s Abbey Theatre. Amongst the poems for which he is most fondly remembered is ‘The Lake Isle of Innisfree’, a composition inspired by his many holiday visits to Sligo, where, in a churchyard beneath Ben Bulben, his remains now rest. The decision by Irish Ferries to name their new vessel W. B. Yeats is one that continues the tradition adopted by the company of selecting names drawn from the world of Irish literature. Commenting, its managing director, Andrew Sheen said: “In choosing W. B. Yeats from the many whose works are revered by Irish people and students of literature the world over, we have selected one that will give the new vessel its own distinct identity and stir memories of a poet who is held in high esteem by so many, here and abroad”. Ships’ registration, regulation and other operational and legal aspects also ranked amongst the factors that needed to be considered, as was the desire to choose a name that would sit comfortably alongside those other great literary figures whose names adorn other vessels in the Irish Ferries fleet. Noting that W. B. Yeats is one that will need no introduction to people across the world, Andrew Sheen said: “It is a name that will convey a sense of the magnificence and grandeur that passengers can expect when travelling on our new vessel, sailings of which are expected to commence on the Dublin – Holyhead and Ireland – France routes from mid-Summer next year”. When built, the W. B. Yeats will have space for 1,885 passengers and crew, 1,200 cars and 440 cabins including luxury suites with their own private balconies. Other facilities will include a Club Class lounge with direct passenger access from the car decks, á la carte and self-service restaurants, cinema, shopping mall, choice of bars and lounges and exclusive areas for freight drivers. Pet owners will also be comforted in knowing that dedicated facilities for pets are also being provided on board. Noteworthy in the context is that Sandymount, where Yeats was born, is located on the city’s southern coastline from where residents can look out upon the shipping channel into Dublin port along which the vessel that will bear his name will sail. The choice of W. B. Yeats as the name for the new vessel has proven to be a lucky link for Co. Leitrim woman, Lee Maxwell from Manorhamilton. Living close to Yeats’ beloved Co. Sligo, Lee’s good fortune in being chosen from the huge number of participants who suggested the poet’s name is said by Irish Ferries to be proof of what a ‘magical’ choice the name W. B. Yeats is. Picked from the thousands who shared her choice, Lee’s prize of free travel for life will be presented to her shortly.